Getting together with friends and family is always fun (okay, sometimes it’s more fraught than fun, but you know what I mean). Over the years I have accumulated recipes that have become favorites, and when we have them we share the memories of past times. One of these dishes is Cream Cheese and Olives. When we grew up in New Jersey, we would drive to Maine during the summer to spend time with my great-grandparents. My mother would make Cream Cheese and Olive sandwiches during the drive. Now I make it to spread on crackers or to put on toasted English muffins. The first time I made this after I met my husband, he was dubious about tasting it. He liked it, and now knows to expect it when we’re going to a party or if family is coming over. This couldn’t be easier to make. I use an 8 oz package of 1/3 less fat cream cheese and let it soften at room temperature for about an hour. I use pimento-stuffed olives and chop them until they’re small enough to blend easily, but still chunky enough to let you know what’s been mixed with the cream cheese. I also add a teaspoon or two of olive juice to ramp up the olive flavor and make the cream cheese looser and easier to mix and spread. I cover the bowl with plastic wrap and refrigerate it overnight to let the flavors meld. 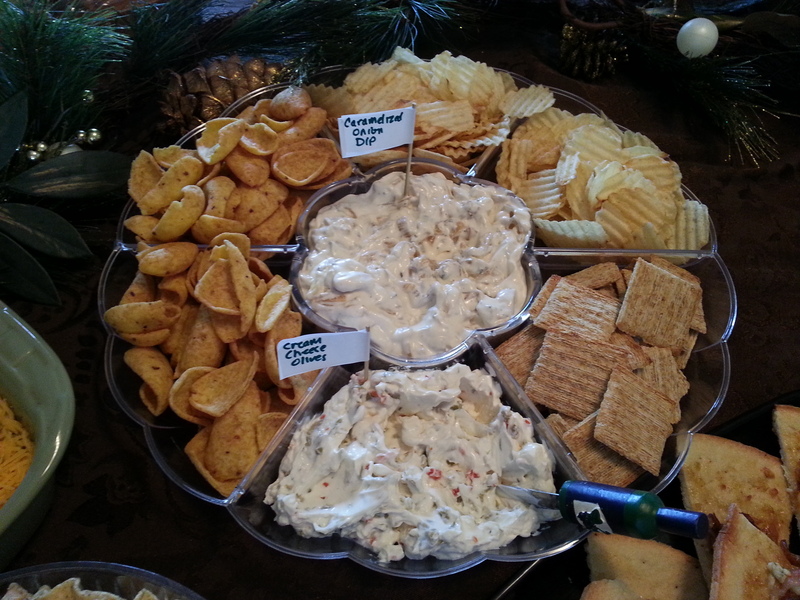 To serve, I put it into a pretty serving dish and use a seasonal spreader or small knife to put the cream cheese and olives on crackers (my favorite are Triscuits). This picture is from our annual Sausage Party (we make Italian sausage every year – more about that later in the year).